it's ID as atrovaginata. Any thoughts on what it is? Shoots look like P bissetti to me, but could easily be something else. The yellow in the older culms could just be low nitrogen or immature shoots in any case. Looks more like yours. Maybe it is bissetii. Bissetii is definately a possibility(Just hope it isn't the dwarf variety if it is. Another strong possibility based on the shoots and overall appearance of the plant may be Phyllostachys Flexuosa. 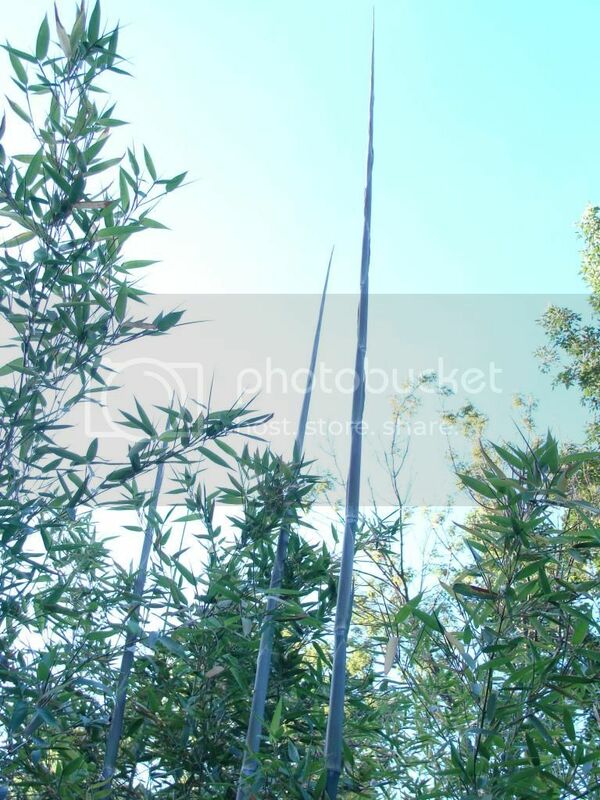 There is an interesting comment on page 116 of Daphne Lewis' book Farming Bamboo under the heading of Phyllostachys Atrovaginata(congesta) - Flowering. "Some P. flexuosa has been mislabeled P. congesta and recently is flowering." That led me to investigate this possibility. Also the culms do exhibit some defined zig-zagging, though again that may be that it is just a young plant. Also note that the plant has thrown yet another shoot bring this springs total to 7. Not bad for a mostly top killed 1yr old plant. I have, or had, a couple of plants sold to me as P flexiosa. I could not tell the shoots from bissetti. The main difference seemed to be it was less cold hardy. The other difference was wider and more horizontal branching habit. Edit: I had some bissetti I thought was dwarf, as it ran around at 12-15 ft for a few years before it put up any taller culms. if you look closely, shoot on his photo has the reddened pattern inverse to your 2009 bisetii photo. 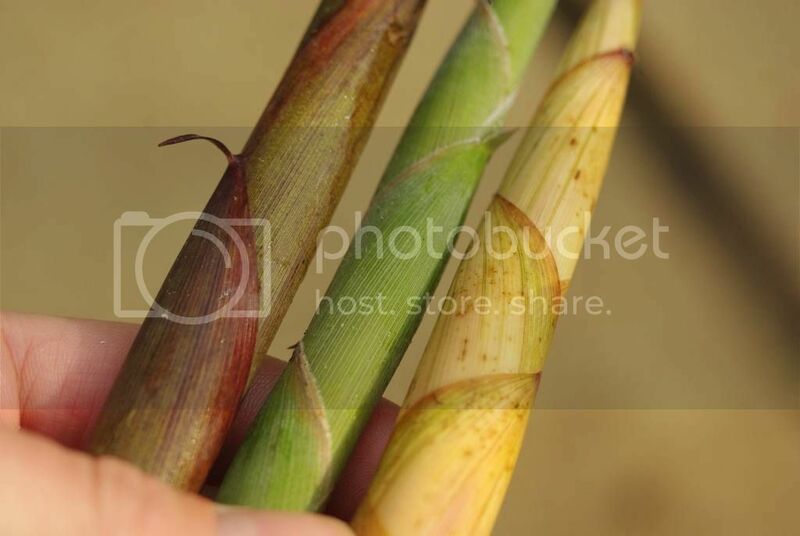 It (culm sheath) seems to go from reddish to green while your goes from green to reddened green. 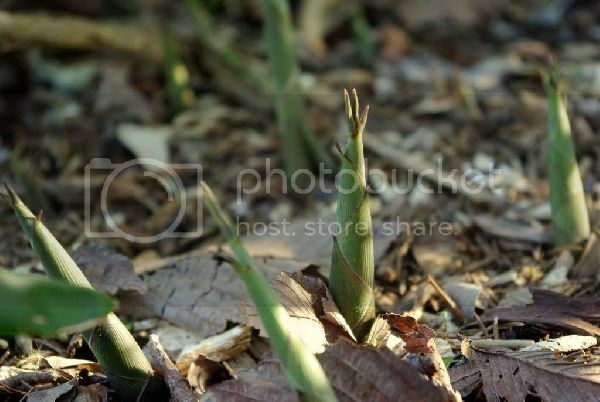 Many juvenile shoots look very similar. 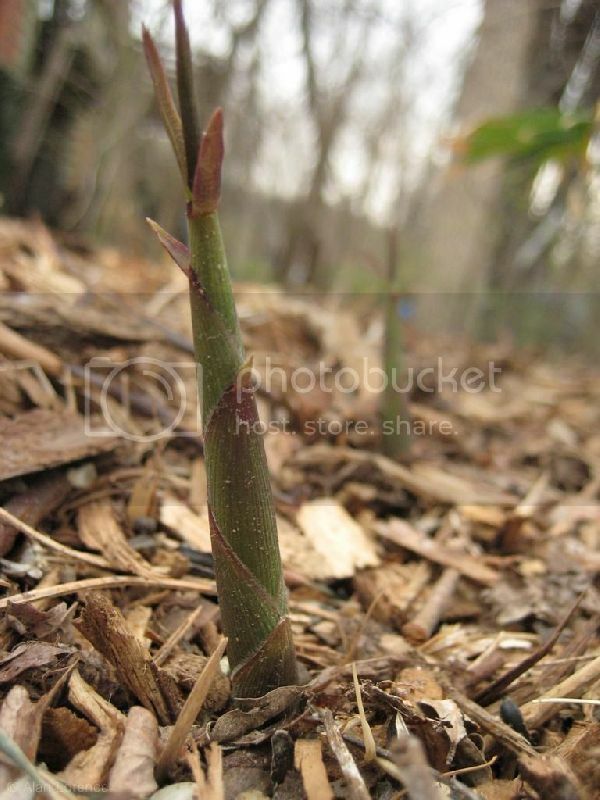 For example - Phyllostachys arcana 'Luteosulcata' seedling I have is not much different at this stage. I think you will be able to ID it next year. Shoots just need some time to mature. To me, these seem to be too juvenile. At sheath fall there may be telling signs if it is Bissetii. I think I got myself a little confused in above posts. I think P stimulosa is the one that looks like bissetti, but with more horizontal branches. What I call P flexiosa, aka zig zag, went to flower here a decade or so back. The emerging culm sheaths are a solid dark purple. Once the bamboo has emerged, it is a basic green P with medium sized glossy green culms, moderate hardness, but capable of spreading vigorously in the right conditions. Please correct me if I am mistaken, I have notes on these sort of things, but would have to look for them at this point. Powder, a pretty good amount of it. 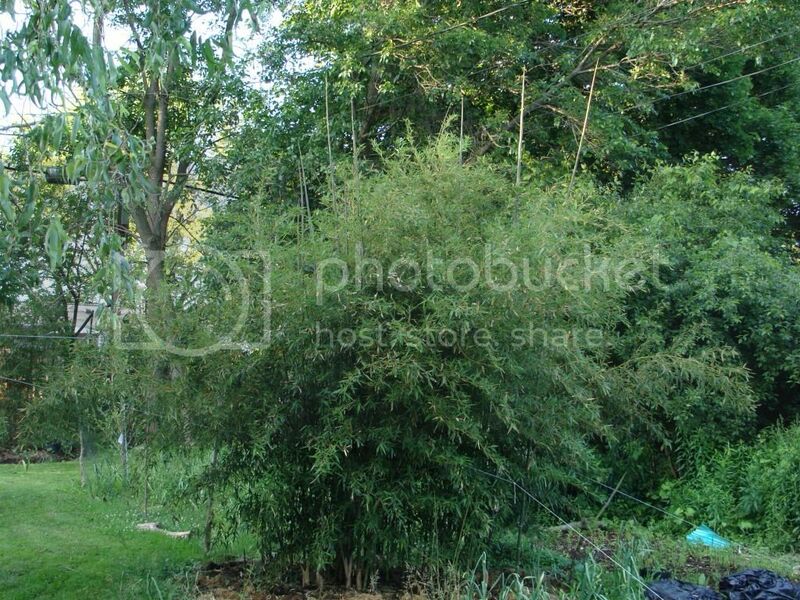 This is why I hate trying to ID bamboos and why I'm not really very good at it. More images of the mystery boo to ponder. Tops of the new culms are fully wine colored, seems to be related to sun exposure and/or age of shoot. Based on the dark color of the sheath leaves and how the top nodes tend to elongate at about the same rate as the bottom nodes, I believe you do have atrovaginata. I also see a 6th shoot on the side, and from what I've seen out of atrovaginata, it does tend to make more shoots after the initial wave. On that shoot near the pen, I also noticed the wrinkle in the top sheaths, and I've seen that out of atrovaginata. 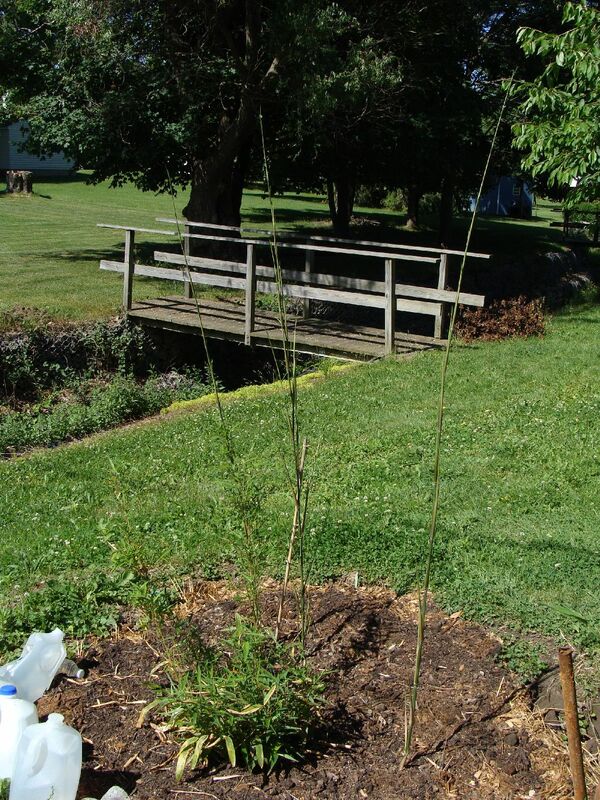 The overall profile of the old 2 old culms, and coloration of new shoots appears to match pretty well. If it is atrovaginata, you are in for an enormous upsize next year given that all the shoots are well protected. I've found that the griffin's greenhouse thick agricultural fabric appears to work the best for winter protection over any other kind of tarps since it never heats up, and has the best insulation. This is what I'm talking about. Here's the overall progression of the atrovaginata which could this year make it up to 20ft given that it held a good number of leaves, and doesn't have top kill this winter. 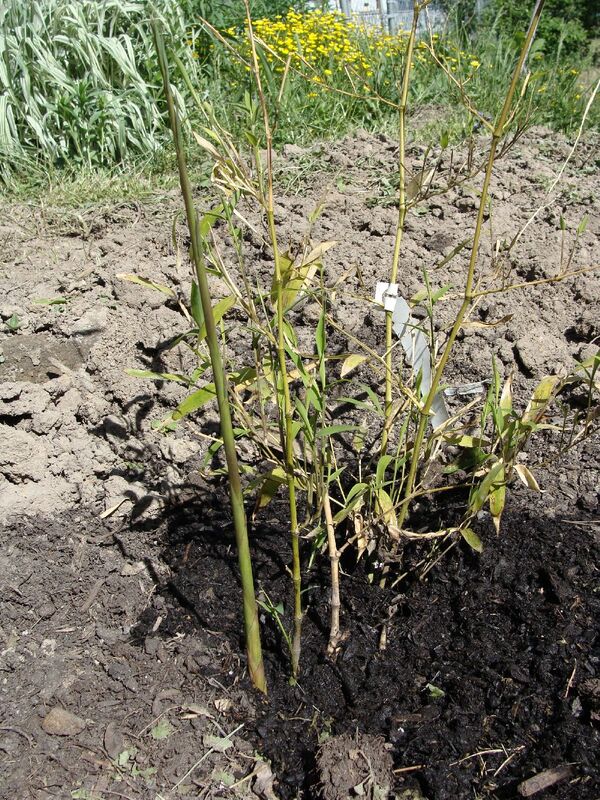 2013 This was this bamboo's best year where the culms reached up to 19ft with slightly over 1 inch culms, but the following winters were simply brutal, and it lingered around 12-14ft culms in the following years, but this year, it should be up in size again. It still won't beat out the parvifolia which was mostly unscathed last winter, and standing at around 22ft now in for a nice upsize this year. I visited a nearby park in Springfield, MO today and there is a phyllostachys shooting there with smaller shoots resembling mine as well as some larger ones that definately look like atro. I only had my cell phone so I was only able to get good pictures of the larger shoots but here they are. For scale most of these shoots are 3/4" - 1" in diameter with the grove being only about 15' high at this point. I don't know how old the grove is. Another bamboo there I observed was shooting. It was also completely top killed. Lets see If I have learned anything. Is this Aurea? It has the tortoise shell structure at the base of many of the culms. 1st one appears to be Bissetii, yes, 2nd Aurea.